If you follow me on Instagram…you’ll know I toke a trip to Amsterdam a few weeks ago with a couple of friends. It was my first time there, and I thoroughly enjoyed it. I went for three days…but to be honest I wish I went for longer. Our flight there was at around 6am (VERY EARLY! ), but I was pleasantly surprised the flight was only an hour, which meant we had a full day when we arrived. We flew in to Schipol airport – I think that’s the main airport most flights from Amsterdam go to . We got a tram to the centre where our Air BnB was. I won’t tell you about the place where we stayed because I honestly wasn’t that impressed with it and wouldn’t recommend it. It was in a good location though (central) and the landscape outside was beautiful. When we arrived we had a few hours to kill before we could go to the flat where we were staying so we grabbed some coffee and food (the BEST apple pie), and then walked around the centre and the market. We were really tired on the first due day to the early flight (seemed like a good idea at the time we booked it!) so after dropping our stuff off at the flat, we just explored more and went in a few shops. No holiday is complete without a trip to Zara of course! We spend the nights eating dinner and having drinks in bars, and of course looked around the famous “red light” district on several occasions. Amsterdam’s a really popular destination for stags dos etc so theres always a ton of people still awake at night walking around the centre. Luckily one of my friends was organised and had checked out what places were good to visit in Amsterdam. We went to 2 museums; the Van Gough museum (which I’m sure is very well known) and another museum called Rijksmuseum. If you wanted to visit one I’d definitely chose the Van Gough. We also went to the Anne Frank museum. After hearing about Anne Frank so much in History lessons and also in general, it’s definitely an eye- opener seeing the place where she lived in real life. Obviously, it is upsetting but I’d definitely recommend going if you are in Amsterdam as its such an important part of history. Be aware though it’s an extremely popular place to visit, so do your research before going as you can not buy tickets there (at least you couldn’t at the time we went). Obviously Amsterdam is famous for all its’s canals. So I really wanted to go on a canal trip. We went on one at night which was cool, and there were loads of other boats out. One of the last places we went to on the final day was a place called “A’dam Lookout” which is supposed to be the highest swing in Europe. It’s a swing on top of a huge tower, and I think you end up around 100ft in the air giving you some amazing views of the city. Not gonna lie I wasn’t brave enough to go on the swing – ha! But my two friends were, and there’s a great rooftop bar and deck there which I chilled out on. I actually didn’t ride on a bike while I was there, but I would recommend hiring a bike as it’s the way everyone gets around and you’ll be able to cover more ground and see more things on one. I’ve never seen so many bikes in my life. Overall I had an amazing time in Amsterdam, I thoroughly enjoyed my time there and my only regret was that I didn’t go for longer. I hope to visit again. I would definitely recommend going to anyone thinking of it. Where should my next trip be to? Previous Post MY FIRST POST!!! 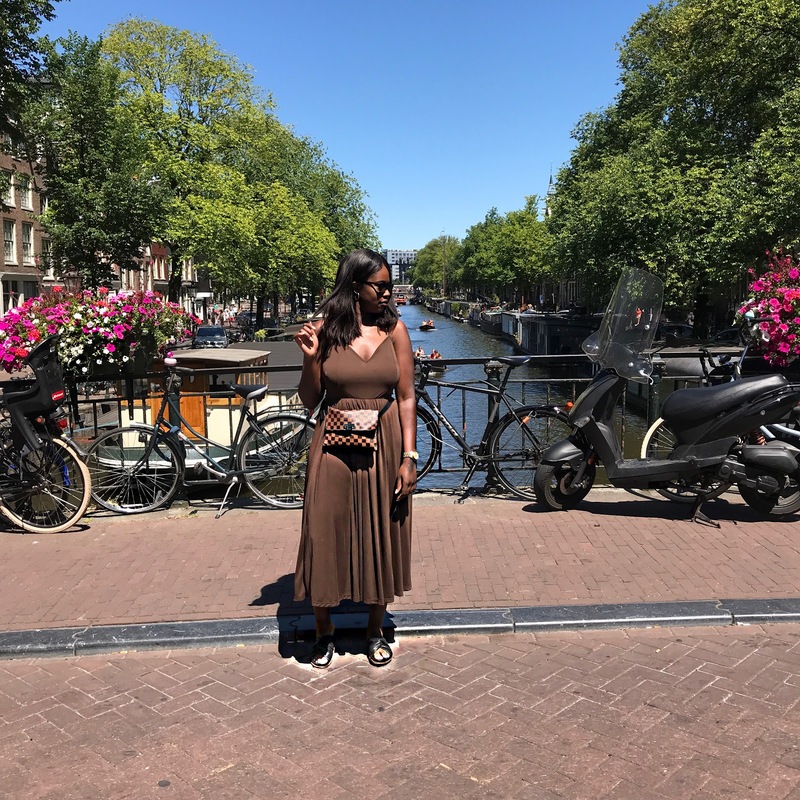 Next Post Amsterdam – Part 2 + My First Youtube Video !! !